Hans Conrad Gyger (1599–1674) was a painter, mathematician, surveyor and cartographer in Zurich. Gyger was the first to systematically survey a larger area in Switzerland. This resulted in the map “Grosse Landtafel des Kantons Zürich“ (Great Land Board of the Canton of Zurich; 1664–67). With his map Gyger reached a fundamental progress by displaying mountains – until then drawn in template-like side views – as elevations of mass. Thus continuous mountain ranges and valleys seen from oblique forward became apparent, not unlike today’s bird’s-eye-view-maps. 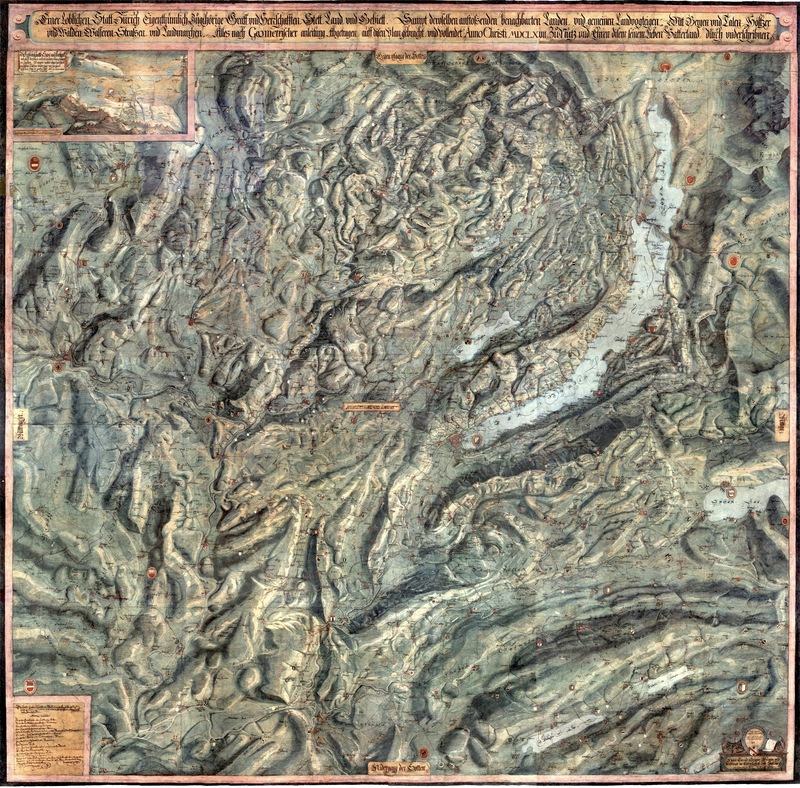 His map of the Zurich area took 38 years to survey and paint, and is considered as one of the most beautiful cartographic works of that time. Because of its high military importance the map was kept secret, and, unfortunately, had no influence on contemporary cartography. Not until 200 years later were shaded relief maps of comparable quality and beauty produced. Seminal William ‘Strata’ Smith geology map rediscovered — A first edition copy of one of the most significant maps in the history of science has been rediscovered in time for an important anniversary. Richard Edes Harrison: Mapping the world at war — The most powerful of these images anticipated the perspective of Google Earth. Canyonlands National Park texture and shaded relief map — National Park Service cartographer Tom Patterson is a master of texture and shaded relief. He’s released this gorgeous map of Canyonlands National to the public domain.